HomeBlog July 2014 Craft Painting Basics: How do I start? Where do I begin? Craft Painting Basics: How do I start? Where do I begin? I suggest starting with 6 - 12 bottles of coordinating acrylic paints making sure that you include black and white because they will help you change the value of one color easily. There are many different kinds of paints on the market available to you, everything from simple craft acrylics to heavily pigmented artists acrylics. You will find a variety of sheens too from matte, satin to gloss. Plus you will find different paint formulas for different types of surfaces as well as new multi-surface paints! Oh and then you will find fun extras like glitters, metallic and even neon paints. Experiment with them all from time to time to find the paint formula you like best for the craft painting project you want to create! I like painting with golden taklon bristle brushes which are perfect for working with water and acrylic paints. Start with a couple different kinds of brushes: flats, rounds, and liners. You might start with a NO. 4, 8, and 12 Flat, a No. 4 or 6 Round and a No. 1 Liner. And for basecoating I would suggest either a 3/4" Flat or a 1" foam applicator. Be sure to keep on hand a brush cleaner and cleaning disc as you will want to clean your brushes after each use to prolong their crafting life! Of course you will need a surface to craft paint! The easiest type of surface to begin craft painting on is a wood surface such as a plaque, box, birdhouse or wood frame. However, take a look at all types of surfaces such as: terra cotta, canvas, paper mache, fabric, glass, ceramics and even metal! Brush basins are awesome because they hold the necessary water for cleaning or rinsing your brushes between colors. Inside the basin you will find compartments and ridges which are helpful to use when cleaning your brush. Simply rake the bristles across the ridges, this helps to remove the paint. If you cannot afford a basin at first, you can use any clean recyclable glass jar (like an old pickle jar) to start, but do plan to get a brush basin soon; you will LOVE it and won't want to paint without one! There are waxed paper palettes and palette keepers on the market available for purchase, however, I like to keep it simple and use an easy-to-grab foam plate as my palette. It works well and is easy to dispose. And of course, you will need soft, absorbent paper towels to blot excess moisture from your brush. Everyday household items like: pencils, a dead ballpoint pen (or stylus), a ruler, sandpaper, rubbing alcohol, stencil tape, toothpicks, cotton swabs and scissors can be added to your craft paint supply basket. There are more supplies you can gather and have on hand, however, these are the basics. Once you have developed a full blown interest in painting, try to add a few more optional supplies to your craft painting arsenal like: stencils, stencil brushes, tracing paper, transfer paper, varnishes or spray finishes just to name a few. Finding project inspiration is easy; it is all around us daily. Take a look at craft manufacturer websites like plaidonline.com for project inspiration where you will find hundreds of craft paint projects, inspiration and step-by-step instructions. I also like to suggest that you follow Plaid Crafts on our YouTube channel where you can watch all sorts of craft how-to videos. Still looking for more inspiration on the internet? 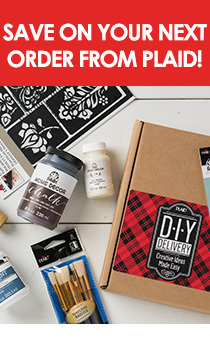 Subscribe to this craft blog, The Plaid Palette, if you are not already a subscriber. And I highly recommend checking out our craft inspiration boards on the Plaid Crafts Pinterest account. Now remember, while you are shopping craft stores, check out the store signs for project inspiration. And of course, there are lots of craft project inspirational photos and instructions to be found in publications! Once you have found your project inspiration, purchased or gathered the necessary supplies, it is important to take a few minutes to set up your work station. Key to craft organization is to work in a "somewhat neat" area! Believe me, crafting can get messy and with most creative folks, it does get messier before it is clean! However, if all your necessary supplies are close at hand, you won't have to stop working to locate an integral supply needed for your project. If possible clean up your crafting work station between projects. It is so much more fun to sit down to a clean spot to begin your craft painting fun! Is it necessary to have talent? Do you need to know how to draw? Absolutely NOT, if you have drawing skills all the better, however, it is not a requirement when there is so much inspiration and step-by-step instructions with patterns out there! Most beginner craft painters start with a simple project of stripes and polka dots, simply dot flowers or use stencils, etc., all can be accomplished without a pattern. So ... begin today, don't wait for the time to be right, find a few moments to become inspired, create your shopping list and begin gathering your supplies. You only have to take that first step to becoming a craft painter! I offer this encouragement and will leave you with a few helpful hints. Enjoy and have fun! 1. Have fun always, it is not brain surgery! If a mistake happens, go with the flow and paint an additional element, like a leaf over a flower petal for example. 2. Make a list of projects you want to create. 3. Keep a running list of supplies you may want to grab next time you are at the craft store. 4. Always keep an eye out for color combinations. Color inspiration can be found in everyday life. 5. Share your interests with others, you may just find a painting buddy in the mix. 6. Attend classes to learn new techniques. 7. Follow websites, blogs, and Pinterest for inspiration. 8. Try thrift store or second hand shopping for unusual surfaces that can be upcycled. 9. Listen to your favorite music artists while crafting; it will keep you relaxed. 10. Wear "crafting clothes" rather than your "Sunday Best" in the event a paint spill happens!